Chain Lubricant protects very well, deeply penetrates, fast evaporates solvent contains. It is resistant to leaching by water, protects against corrosion and aggressive external factors, by reducing friction reduces wear. It contains an increased amount of Teflon. For use in the usual chains and those equipped with O-Ring, X-Ring, or Z-Ring seals. 360 * Special nozzle allows application at any angle. Clean the chain of the old grease and dirt. 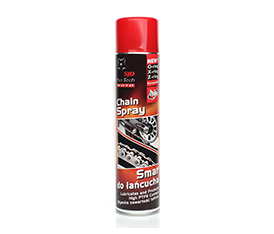 Apply Chain Lubricant directly and uniformly on clean chain, keep distance of 20 cm while applying.